Fisher & Paykel Appliances has taken the covers off its ninth-generation DishDrawer dishwasher and it’s a real head-turner. While the majority of dishwashers are just plain old white metal boxes with a door and some function buttons, this little gem takes another route entirely on the design front. As you can see from the pictures, the DishDrawer dishwasher is designed for maximum visual impact. And, to make its bold style statement the Fisher & Paykel unit calls upon the timeless power of black. Featuring black brushed stainless-steel front panels the appliance really dazzles with complimentary black anodized aluminium handles and buttons that add an extra touch of pizazz. Put it all together and you’ve got a dishwasher like no other. Along with the gorgeous looks, the DishDrawer dishwasher boasts an impressive arsenal of 15 different wash programs. You can choose from the likes of Rinse, Fast, Delicate, Normal Eco, Normal and Heavy, which means that the Fisher & Paykel dishwasher is more than able to handle any kind of dishwashing task. In fact, the appliance can tackle anything from greasy or grimy pots and pans through to delicate bone china and handle-with-care crystal glasses. Fisher & Paykel Chief Designer Lauren Palmer says that the inspiration for the new model came after garnering feedback from the likes of architects, designers and, more importantly, their own customers. Style conscious fans of the brand have been experimenting with black and darker stained timber finishes in their own funky kitchen designs, so the arrival of the new charcoal coloured DishDrawer dishwasher is certainly timely. 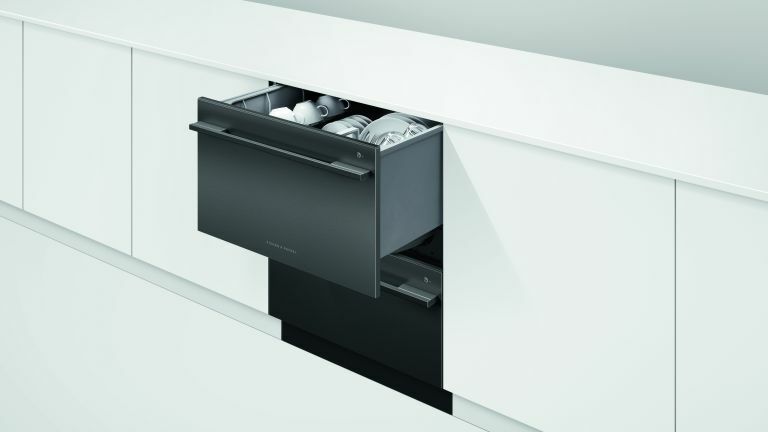 As you’d expect from this premium brand, the DishDrawer dishwasher can be installed flush with your cabinets, which results in minimal gaps and, ultimately, helps to produce a super-slick kitchen layout. “It gives the customer more choice, and that’s a key aspect of design flexibility,” adds Lauren on why the new appliance will help boost the look of your kitchen. The dishwasher is also going to work in perfect harmony with Fisher & Paykel’s other high-end appliances, including its black French Door Refrigerator, black Classic Ranges along with an all-new range of black built-in ovens. How much more black can you get? As Spinal Tap once said; none more black. Fisher & Paykel reckons the black beauty will also run at very low decibels, so as well as looking great it’ll be nice and quiet too. We also like the sound of the twin drawers, which can operate independently so you can pop in a half load. That means you can do quick washes that not only save time, but will cut back on water and energy usage. The internal racking can also be adjusted in order to accommodate all manner of dirty dishes and cutlery. Meanwhile a child lock stops your little ones from opening the drawers and the function buttons are disabled too, so the dishwasher will be perfect for anyone with a family.